Here’s a question for ya: What do Doug McDermott and the World Cup have in common? Answer: Both involve lots of talent and success that make other people jealous. Sure, both have lots of fans cheering them on, hoping for their successes. Unfortunately, I’ve also witnessed a lot of jealously upstage emotions of support and encouragement. Let’s take a deeper look, shall we? Doug is a recent Creighton University grad. He played NCAA Division I basketball for the Creighton Blue Jays, where he achieved some pretty sweet accomplishments. In the 2013-2014 season, he led the league in points scored, while setting an NCAA record scoring double digits in 135 games. He’s also ranked fifth all time in NCAA history for points scored. It comes as no surprise that Doug will likely be drafted in the first round of the upcoming NBA Draft. I didn’t know much about Doug until a couple weeks ago. Ninety nine of us Midwest peeps got a chance to meet him – and shoot some hoops too! Let’s be honest, #27 who makes that killer shot at 1:15 probably got the attention from some NBA scouts too, yes? After I stopped giggling with excitement over this, I decided to do a google search. I was curious to see where this video was showing up and what people were saying about it. I’ll have that Reddit user know that I am NOT that rando. Rather, I am NUMBER TWENTY SEVEN (which was more or less my name that day). During my evening where I couldn’t fall asleep last week, I left my room and ended up turning on ESPN. Guess what they were talking about? It’s amazing what we can learn at 2:00am. Watching this clip that night changed my mindset. 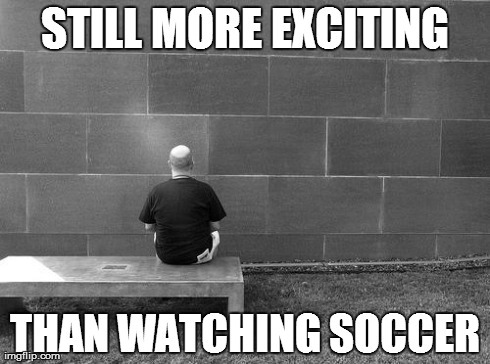 While soccer still isn’t relevant to me, it’s relevant to thousands of people – like, really relevant. (Seriously, look at the dude pumping his arms! HE’S SO HAPPPY.) Why would I wish ill of something that has this effect on others? It’s easy to get jealous and selfish. Yet it’s such a silly thing to do. We’re not going to be good at everything. We sure as hell aren’t all going to be good at basketball. Why do we need to be jealous when we see a 6’8’’ guy from Iowa make these amazing shots? (By the way, I can promise that none of these involved any kind of CGI). Next time you find yourself getting jealous over someone or something, stop and ask yourself why you’re jealous. Is it because you’re witnessing someone accomplish one of your own goals? If that’s the case, cool! You’re on your timeline. Start tracking your own progress and stop comparing it to someone else’s. And if you’re not, why be jealous? Celebrate their accomplishments with them! Crazy idea, right? But why not try it and see how happy it could make you? Now if you’ll excuse me, I need to go work on some more trick shots. Doug might get drafted by the Bulls and he’s obviously going to want to hangout. Want to get an email when I update? Hit the “follow” button at the top of the page! Last night I couldn’t fall asleep for the life of me. Anyone else ever experience this? There’s a few different tactics I use when I can’t fall asleep. One of them is to watch Netflix. 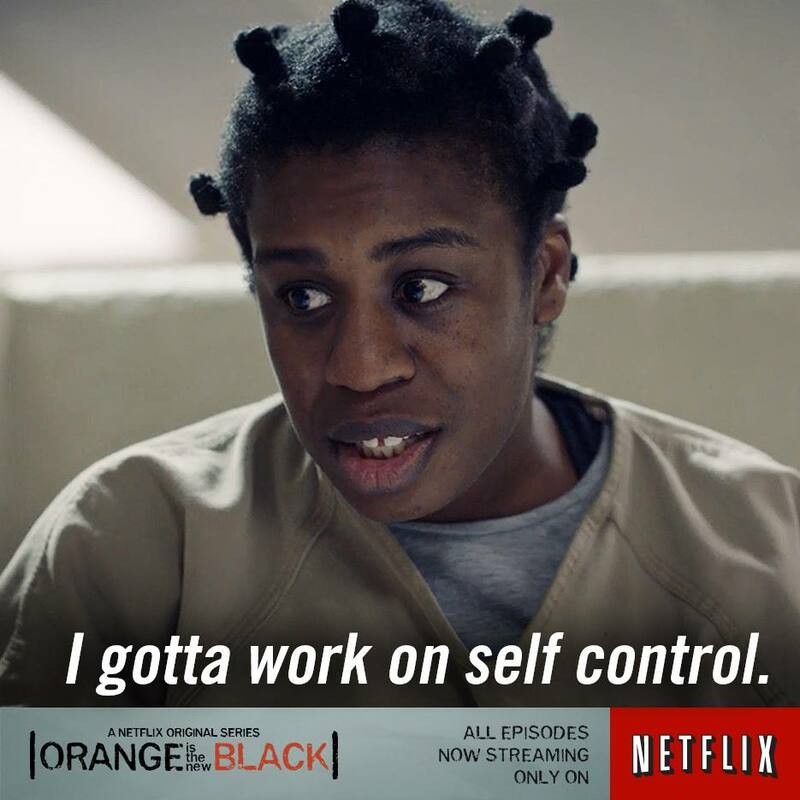 I’ve been watching a lot of seasons 2 of “Orange is the New Black” this week. Then there are some rare times where I’m really feeling frustrated. In this case…I’ll head for the kitchen. Despite working on getting a six pack – a silly fitness goal that I’ve had for a while – I did this again last night. Late night snacks push me further away from my goal. So why did I still do it? 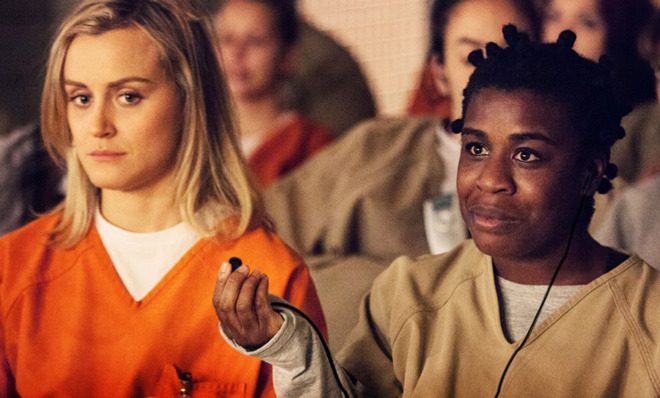 Think about the characters in “Orange is the New Black.” They want freedom. Yet many of them constantly take risks that – if caught taking – could result in a longer sentence. They obviously don’t want more jail time. Yet they still take these risks. When we’re in an uncomfortable situation, it’s easy to think about the short term. We’ll take action that temporarily makes us feel better, but can hurt us in the long run. Taking this easier, yet more destructive path isn’t usually the best decision. But it’s an easy way to go when we’re feeling frustrated or weak. So how do we avoid this? It depends on the situation. If it’s goal related, I recommend getting an accountability partner to keep you in check. It also helps to make a vision board that you can see each time you wake up. I may or may not have a poster of Shaun T and his abs on my wall right now (I’m sure my roommates are confused by this). Despite taking these extra steps, we’re still going to have days when we fall off track and make mistakes. While it’s easy to get frustrated when this happens, I urge you not to kick yourself. WE’RE HUMAN! We all make mistakes. Go to bed (if you can), wake up tomorrow and be better than you were yesterday. Here’s something that’s made me feel better: Making mistakes and falling off track leads to a better “you.” I used to snack on chips and carbs at night. Last night I had almonds and sun flower seeds. We get better as we go along. Feeling brave? Share a story about a time you fell off track in the comments below. Don’t share if you’re embarrassed. Share because you know it will lead to a better you. Are you a listener or a superior? Have you ever looked around your gym and noticed members who aren’t in shape? Okay that sounded bad. I swear I’m not mean (nor am I a crazy stalker). I’m not referring to the people who purchased a membership last week, nor am I talking about those making progress week by week. I’m talking about the meatheads who have ripped arms, can bench 300 pounds, but still have a huge beer gut. Or the guys with a sculpted upper body, but have tiny legs. They seem incredibly knowledgeable when it comes to working on arms and chest, yet appear to be neglecting other areas. It makes me wonder: How open are these guys to learning more about their workouts? For me, I used to be very close minded at the gym. I had my workout plan and liked it. I didn’t want to switch it up, and I sure as hell didn’t want to listen to anyone try to tell me what I was doing wrong. Eventually, I switched things up because I made the decision to be a fitness coach and had some learning to do. I started a program called the 21 Day Fix to learn more about portion control. It also included workouts to do seven days a week from home. Home? Why the hell would I workout from home? I can’t do bench press from home. WHY IS EVERYTHING CHANGING? It didn’t help that I was extremely intimated by Autumn Calabrese, the woman with the perfect body who talks you through all the workouts. Oh boy, does she push you! I made it through the three weeks. Days 1-4 were rough. Days 5-21 were….actually, pretty fun! I was shocked to learn I enjoyed working out from home. I never would have listened to anyone try to tell me this. After finishing the program, I realized just how reluctant and close minded I was with my workouts. We have a tendency to be close minded in areas we’re passionate about and experienced with. The scary part is, we don’t always realize it. We assume that because we learned a lot in a particular area, it would be silly to take information and learn from someone else. This especially comes into play with people who are younger or less experienced than us. We miss out on growing as a person because we’re too reluctant to listen. Next, consider the idea of “being a listener instead of a superior.” In Dale Carnegie’s book, How to Win Friends and Influence People, he talks about how “almost all the people you meet feel themselves superior to you in some way.” The next time you’re in a situation where someone is sharing an idea or teaching you something, consider how you might learn from this person instead of feeling like a superior. If you’re anything like me, you might need to remind yourself of this several times before it starts to work. I tend to go into the “It’s a trap!” way of thinking. We might want to be cautious listening to those meatheads at the gym. But who knows? Maybe there’s something (even if it’s just one thing) we could learn from them. Something I personally like to do is try and be open minded and learn as much as I can. Then later on, I can keep what I like, and “throw away” the parts I don’t. Here’s my challenge to you: Try this on for yourself. Find areas you’re closed off in and think about ways you can be more open. Then, let me know how it goes! Seriously. I like hearing from you guys. Not too long ago, I posted about clipboard people. You know, those people who are SO happy to see you from a block away, despite the fact that you’re considering running into traffic if it means not speaking to them? …sorry. That was too much. I was up late last night. I used to have the mentality of “everyone is out to get me.” In other words, I could be on a free phone call with a highly respected acting coach. Then once I’m on the call, I learn the coach wants me to sign up for his class. (And if you sign up before the end of the call, you save $100 and get a free pencil!) I would be disgusted and eager to hang up. 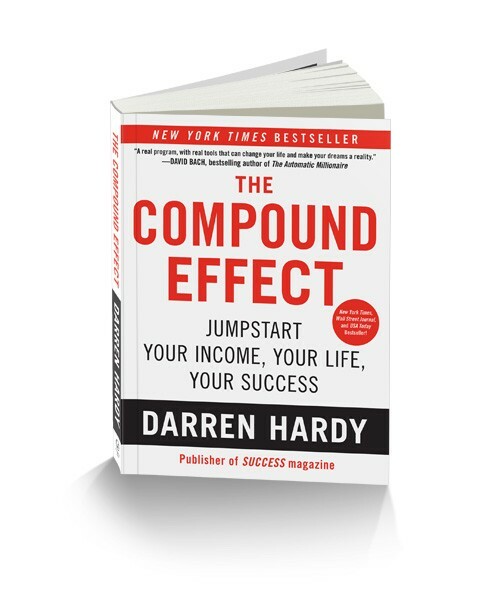 Recently, I finished the book, “The Compound Effect” by Darren Hardy. I didn’t know who Hardy was prior to reading. Now I’m convinced he’s the most successful person in the history of ever. (Google him, if you don’t believe me). If you ever find yourself needing to run a marathon in Chicago with negative wind chills, give “The Compound Effect” a quick read. You’ll be fine. Let’s go back to the stupid clipboard people: Giving them money for their organization usually doesn’t help you. It only helps them. But the next time you’re on a call with that acting coach who wants to give you free pencils, don’t ask how they’re trying to hurt you. Very rarely is this the case. Instead, how might they help you reach your goals? Lastly, I want to address the money issue. Once we find out we have to pay for something, we tend to freak out. (Or at least I do). I’ve found that focusing on what I’m gaining, as opposed to what I’m losing (money) is far more valuable. Perhaps you’ve heard of the phrase “investing, not spending.” If I’m going to a Cubs game, I’m usually spending money. But if I decide I want to give Darren Hardy my money, that’s an investment. How else am I going to run that marathon in January? ….okay no, I’m totally kidding. This is still free. I’m sorry. Did I mention I was up late last night? Want to get an email every time I update? Hit the “follow” button at the top of the page!